For the Epiphany long weekend break, we went to Awash National Park, about 220 kilometres east of Addis, on the road to Dire Dawa. Awash is one of the main national parks of Ethiopia; it is not as known as the Simien mountains, however it has the great advantage of being close enough to the Ethiopian capital for a weekend away. 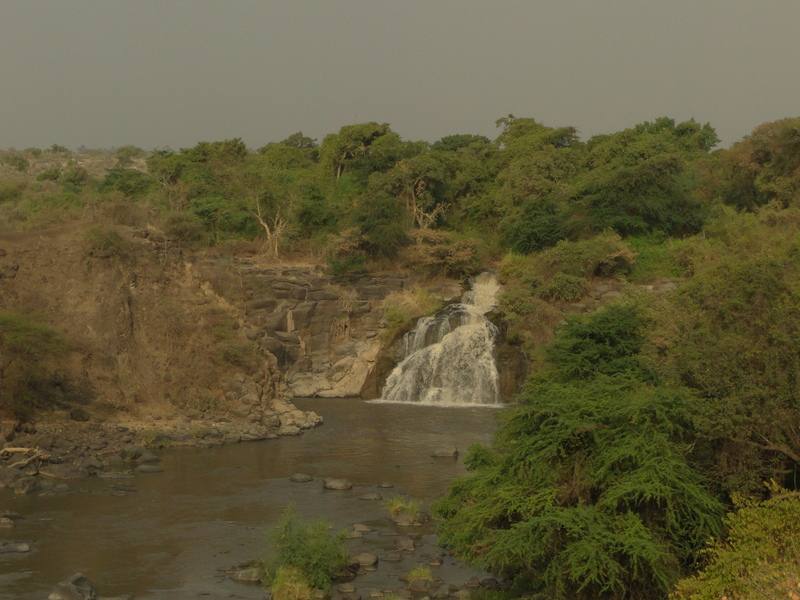 Located on the boundary between the Oromia and Afar regions, it is home for a variety of wildlife, in particular baboons, crocodiles, oryx and gazelles, and numerous birds. On my first morning in the lodge, as I got up a baboon was sitting on the floor of my room! I was so surprised that I scared him out with a loud scream! I later found on the balcony, a pair of socks he had taken and left behind when running away. We stayed in the main lodge inside the park, the relatively new Awash Falls Lodge, built on the edge on the gorge and overlooling the Awash river falls. The setting was spectacular. On entering the Park, we first go through ten kilometres of dry and dusty scrubland, before reaching the green valley around the Awash river. This lush area is an unexpected sight in the middle of the semi-arid park. It takes just over three hours to drive from Addis to Awash, but the change of scenery and the variety in the landscape is impressive. On leaving Addis Ababa, we gradually go down from an altitude of 2500 metres, leaving behind the high plateau with its famous eucalyptus forest and grazing fields. The landscape becomes almost lunar with large craters of extinct volcanoes on both sides of the road. After a while, we drive through a semi-arid plain lined with acacia trees. It becomes much warmer, we’re now at an altitude of 750 metres. We encounter herds of camels along the way. Further on, we surprisingly come across a lake. The sight is almost unreal in the middle of this dry land, a narrow road goes across it, it looks like it was just flooded, but it is probably like that all the time. 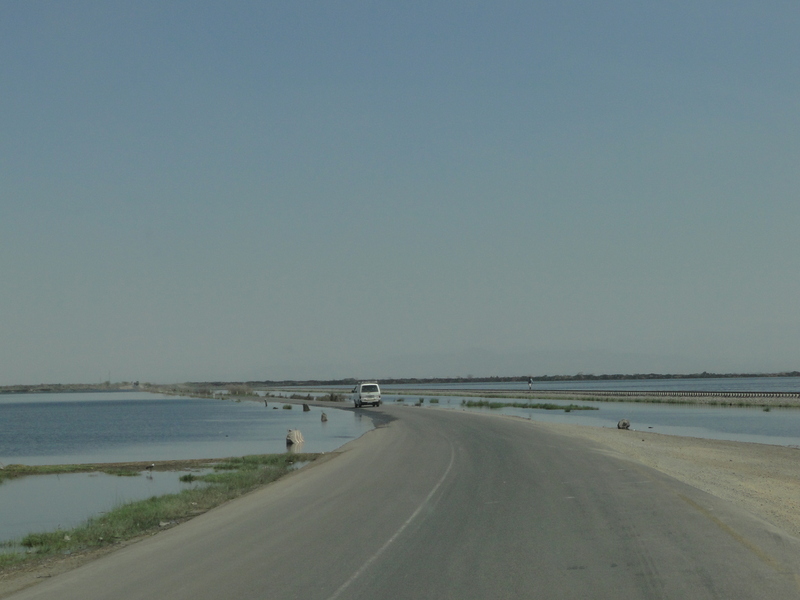 Along the road, we can from time to time spot the old train track linking Addis Ababa to the port of Djibouti. It was built by the French about 100 years ago, and will soon be rehabilitated with the help of EU funds. Once we have crossed the lake, we are very close to Awash, and the gate to the National Park. During our stay there, we go for walks along the river down in the gorge. We come across baboons playing and jumping on trees, we subrepticely notice gazelles gracefully crossing a path and we spot a number of crocodiles in and out of the water. They are difficult to see at first as they merge with the rocks, being of exactly the same colour, but they are an amazing sight! The next short trip is a visit at dusk to the hyena cave, near the footslopes of Mount Fernale, the extinct volcano part of Awash National Park. It is a great moment. We sit in silence about 20 metres away from the cave, watching the sunset and waiting for the hyenas. It takes about half an hour. 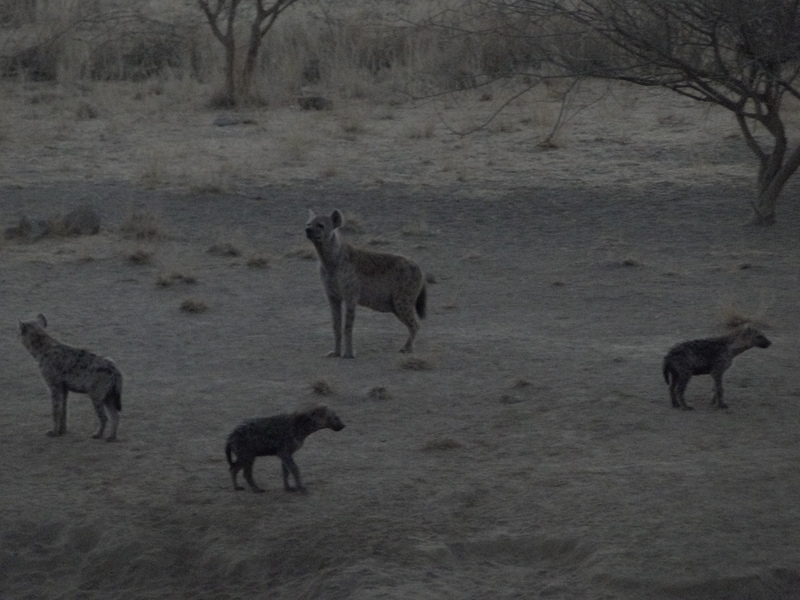 Once the sun has completely disappeared behind the horizon, the hyenas punctually come out. First a couple of warthogs, who live in the same cave, make their appearance. They are soon followed by a family of hyenas. The little ones play around under the watchful eyes of their mother. We all feel a little scared, having been fed in our childhood with many stories about fierce and voracious hyenas. But they are there in front of us, paying little attention to our not-so-discreet presence. Hyenas are quite common in Ethiopia. Even in the outskirts of Addis, we can hear them howl at night. 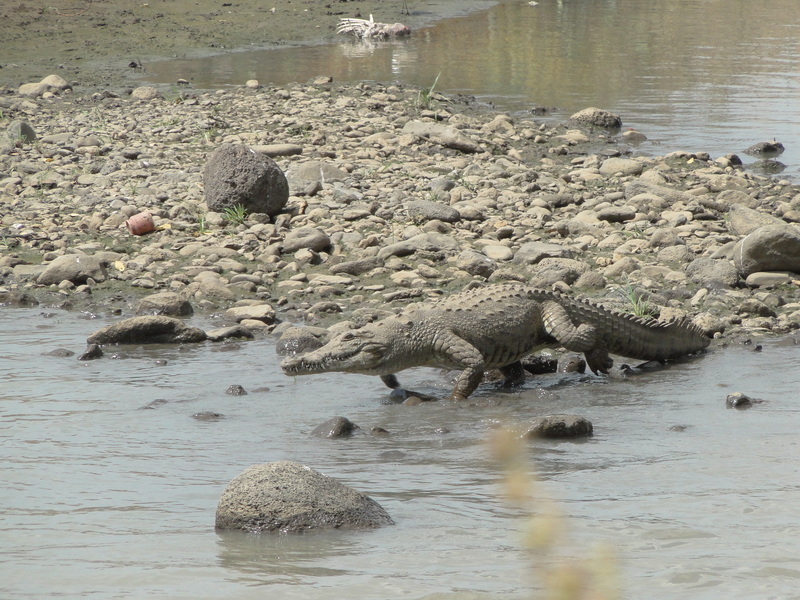 This entry was posted on January 26, 2012 by Salambo in Awash national park and river, Travelling outside Addis and tagged Addis Ababa, awash national park, baboons, crocodiles, Ethiopia, hyenas, mount Fernale.